As Dr. Chadbourne writes in his liner notes: I hope listeners will enjoy this collection of material designed to show the great variety, depth of research and life-affirming philosophy of my various ensembles as the 20th. Century draws to a close. 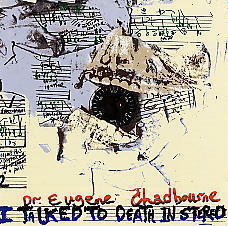 This CD signifies a definite change of direction in Dr. Chadbourne's music, the emphasis being on his singing; he finishes the CD with his favourite song I've Got a Crash on You - and I can guarantee that his singing will be a revelation for many! 68 Minutes of sheer fun and pleasure. various ensembles as the 20th century draws to a close. teenagers could stand some work on. recording in his home studio. The Buttefly Garden suite is part of the Insect and Western collection. to eat whatever one comes up with. giant in the world of Slovenian underground music since the �60s. they were on their way. We wondered what was in these bottles! University continues this depressed philosophy. and Western Party with Change Has Come. latter group interpret Glad to Be Unhappy. the sugarcane fields looking for bug-eyed zombies. singing one of my favourite songs, I Got a Crush on You.